You probably know about Google Translator but I thought I’d briefly write about it here, just in case you’ve never used it. If you haven’t, check it out. It’s a great tool for reaching out across cultures and languages to those you may have met while doing your overseas expedition, and kept their address but never wrote to them because of the language barrier. It also features on-the-fly translation for those using gmail, and for other email clients, quick cut and past from the website into emails works effortlessly. I must admit, my Spanish grammar isn’t the best, (I’ve been told I speak “Tarzan Spanish”). One of these days, I’ll get my conjugations down, but for now, in order to write a somewhat grammatically correct email to my friends in Peru, I admit it, I often use Google Translator. 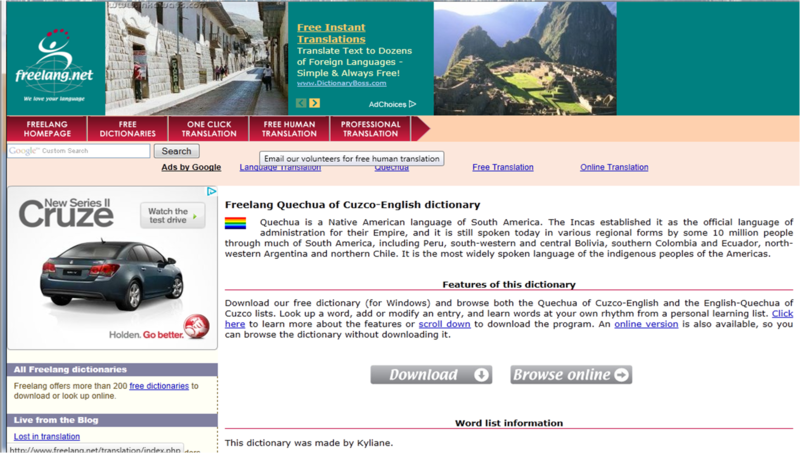 Another cool site I stumbled upon yesterday is Freelang.net where I found a free downloadable Quechua English Dictionary. How cool is that? I’m sure this particular dictionary hasn’t been around that long, so I was excited to see and download it. It works quite well. I haven’t checked out the other languages but you can, at here. So get out there and start writing to someone, anyone and bridge the language gap. Enjoy. This entry was posted on 07/07/2011 at 06:57 and is filed under Experiential Education, Peru, South America, Traveling. You can follow any responses to this entry through the RSS 2.0 feed. You can leave a response, or trackback from your own site.